What: A noncompetitive bike ride Sunday beginning in Riverfront Park. Routes: Riders can choose from four ranging from 1 mile to 47 miles. Registration online: $20. Register at spokefest.org. Or at the event between 7 a.m. and 9 a.m. on Sunday. This is no small feat, considering she couldn’t even ride a bike a month ago. But after a training camp in mid-August, the teenager has conquered the two-wheel balancing act. And she has her mother to thank. “I am aware of how many children have never learned to ride,” Traver said, rattling off disheartening numbers: 80 percent of people with autism, and 90 percent with Down syndrome, never learn to ride. 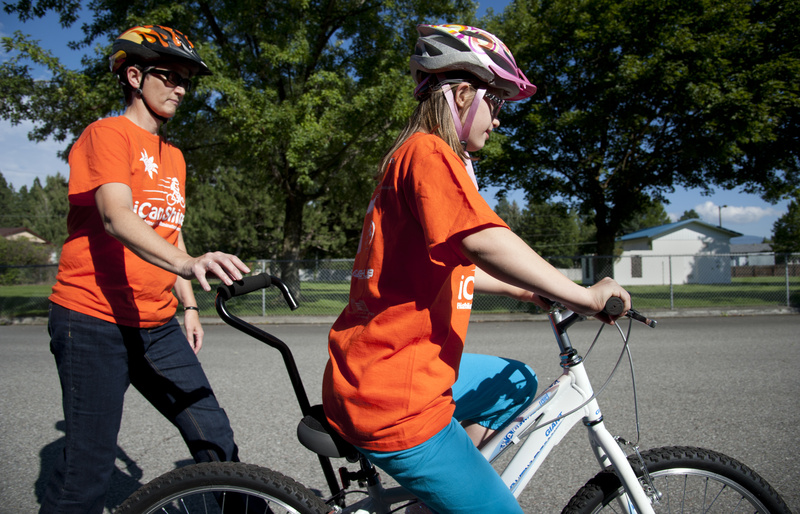 With such facts in mind, Traver organized a local bike training camp for younger people with disabilities through the national I Can Shine organization, which ran similar camps in 32 states last summer. After securing a big enough space for the camp at Mt. Spokane High School and a sponsorship from the Spokane affiliate of the Autism Society of Washington, Traver was able to register 35 people in the weeklong course. Six have registered to ride in Spokefest. “We filled the camp and had a waiting list,” Traver said. Participants ranged from ages 8 to 29, including Heather Comer, who won two gold medals for alpine skiing in this year’s Special Olympics World Games in South Korea. The course had riders assisted less and less as time passed, with balancing wheels decreasing in size before being removed altogether. Each rider, though, had a person on each side of the bike throughout the week. “For relationship building and trust, we try to keep the same two people with them through the end,” Traver said. Two staff members from the national organization – one to work on bikes and the other to supervise rider progress – came out to help. And now the Traver family is signed up for Spokefest, including Stephanie’s twin brother, Gabriel, who will power around the 21-mile loop through Riverside State Park for the fourth time. Bill Bender, who founded Spokefest as a nonprofit bicycle advocacy organization six years ago, said his event has increased its number of riders year by year. And he’s definitely excited by the participation of the people in Traver’s course who will sign up to ride.